Knock, knock. Is this thing on? Hello, friends. It has been some time. Almost a year, in fact! I'm planning to begin blogging again. I've missed it, that's for sure. But in addition to posting food recipes, I'm going to be using my blog to also document my running and fitness regime, and new discoveries on excursions around my new locale. I explore often and I have some fun and exciting personal goals in store for the next 14 months. I definitely want to document this journey. At the moment, I'm not sure if I should start a new blog altogether, or just reformat this current blog. We'll see what happens. Things have certainly changed over the past year. Ron and I moved from Minnesota to southern California this past summer. We live less than a 20 minute drive from DISNEYLAND. For such a Disney fan, it's been pretty damn amazing. We can now shoot up the street for a quick ride on Pirates of the Caribbean -- and then be back an hour later. Even more fun, Dinah now accompanies me as a running partner! She still has her quirks and spontaneous freak-out sessions, but she has developed such a personality and is such a little love-bug. And in the food category, I've made quite a transition. I now border between being a Lacto-Ovo Vegetarian and Vegan. It's been pretty incredible (and sometimes frustrating) to try new recipes and discover plant-based eating that is suitable for both myself and my carnivorous husband. Even more incredible is the honest look of satisfaction that is often on my husband's face when eating said plant-based recipes. Ron is still a full carnivore and after a year of hits and misses, we've worked out a pretty consistent dining routine that works. Phew. Also, a word: I promise not to turn my blog into my own personal soap-box. I live my life a certain way for me, and I would never want to impress my views upon someone else solely because I have them. I made these waffles the other night in preparation for my runDisney Dopey Challenge weekend training run. (Remember those fun and exciting personal goals I mentioned above?) I've been entering some seriously high mileage weeks and appropriate sustenance is key. 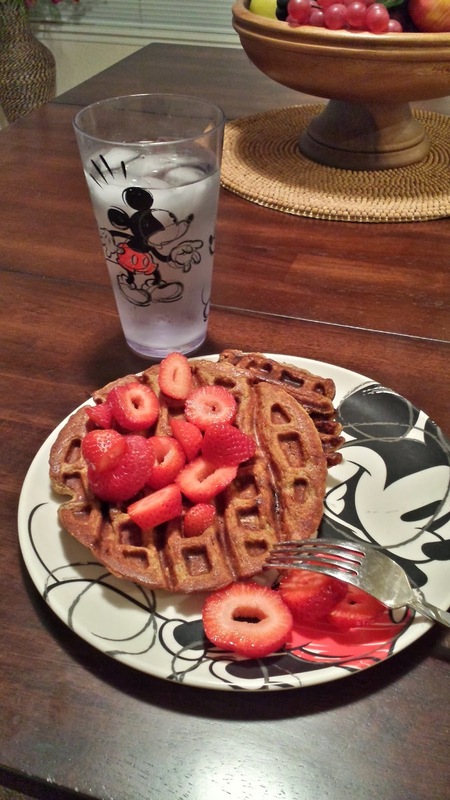 These waffles, aside from being an amazing fuel source, were absolutely divine. The oats and walnuts provided some hearty texture, and the cranberries added just a touch of sweetness. I considered adding some maple syrup to the finished product but they were so flavorful that they were perfect as is. The recipe is vegan but you can easily make it non-vegan. In a mixing bowl, sift together flours, baking powder, baking soda, cinnamon, nutmeg, and salt. Stir in rolled oats and walnuts. In another bowl, combine banana, milk, maple syrup, and oil. Pour wet ingredients into dry ingredients. Mix until just combined. Fold in dried cranberries. Let batter sit as your waffle iron preheats. Pour batter 1/2 cup at a time into waffle iron and cook according to iron instructions. Grease waffle iron between waffles, and keep waffles warm in an oven set at 200 degrees. Enjoy! Welcome back. I missed reading your stories and trying your recipes. I hope you will make these for me the next time I visit. They sound yummy!